This specimen, the holotype, was collected at Tsaagan Khushuu, Nemegt Formation (Maastrichtian) during the Mongolian Academy of Sciences-American Museum of Natural History 2001 expedition. It was made available to the University of Texas High-Resolution X-ray CT Facility for scanning by Dr. Gabe Bever of the New York College of Osteopathic Medicine. This specimen was scanned by Matthew Colbert on 21 January 2009 along the sagittal axis for a total of 431 slices. Each 1024 x 1024 pixel slice is 0.25 mm thick with an interslice spacing 0.25 mm and a field of reconstruction = 301.6 mm. Click on the thumbnail to the left for a yaw animation (2.6 mb) of the isolated Alioramus cranial endocast. 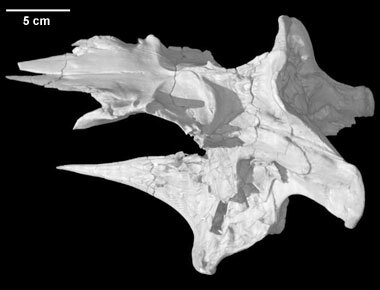 Click on the thumbnail to the left for a pitch animation (2.0 mb) of the isolated Alioramus cranial endocast. Click on the thumbnail to the left for a yaw animation (11.6 mb) of the Alioramus cranial endocast and sinus cavernosus within the braincase, which is rendered semi-transparent. Click on the thumbnail to the left for a yaw animation (12.7 mb) of the isolated Alioramus cranial endocast rendered within the disappearing braincase. To cite this page: Dr. Gabe S. Bever, Stephen L. Brusatte, Amy M. Balanoff, Mark A. Norell, 2011, "Alioramus altai" (On-line), Digital Morphology. Accessed April 25, 2019 at http://digimorph.org/specimens/Alioramus_altai/.